Florida Attorney General spoke with FOX and Friends on Monday after after being verbally assaulted, threatened and bullied by raging leftists at a movie theater on Saturday night. Bondi, the popular Attorney General from the great state of Florida, has been a long-time target of unhinged left. She told FOX and Friends “three huge guys” came up to her and started screaming at her and cursing her an inch from her face. The violent leftists then turned on her boyfriend and tried to provoke him into a physical altercation. 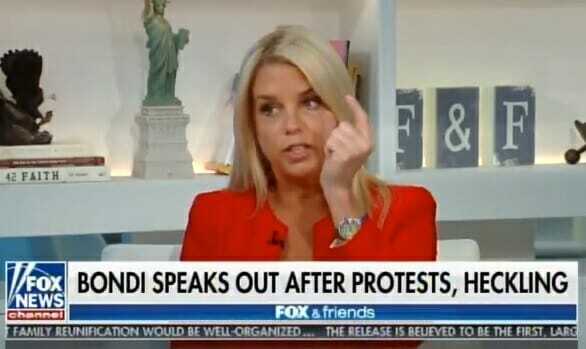 Bondi told FOX and Friends one of the men spit on her while he was screaming. Bondi added that she did not know if this was intentional but occurred because he was screaming so close to her face. Pam Bondi said she will not allow the bullying left to alter her actions or her lifestyle. Here again is the original video that was posted online after the attack.